Ah, goals! The bane of my existence, usually. I managed to reach one big one this year though. That magical 1000 miles! The next one for the year has been tugging at me. As mentioned in the last post, I’m going to take a stab at it. Not a ‘grit the teeth and hammer the pedals’ kind of stab, but ride when I feel I can and let it give me a bit of a push on those days where I feel ‘meh’ about going out. If I make it, awesome! If I don’t, well, I was close and will set weekly/monthly goals to hopefully beat it in 2016. It has put things in perspective post stroke. It’s let me realize how far I’ve come since it hit me last year. Remembering those first few months of pain, barely able to move, let alone ride, without wanting to cry with how much it hurt, but now seeing how well I’ve done this year in spite of that rough beginning has done a world of good for my mental well-being. It’s certainly been more of a lift than repeating to myself over and over, ‘It could have been worse. I’m not in a vegetative state.’ Having other people tell me how lucky I am just made me feel snippy. Lucky would have been catching my high blood pressure before it burst a vessel in my head. I looked at a calendar and worked out that there would be 6 weeks left in the year starting today, (Thursday, November 19th) as New Year’s Eve is on a Thursday. Seeing that actually motivated me for at least one extra ride last week. The more miles I got in before the 6 weeks started, the fewer I’d have to worry about for those weekly goal attempts. The 14th was a rest day. November 15th, Sunday, out we went. It turned into quite a short ride. I had planned on longer, but two miles into it, I suddenly worried that I’d forgotten to lock the storage. I rushed back as fast as I dared with a sluggish husky. Turned out my worry was for naught. The truncated River Loop gave me 4.36 miles for that day. I didn’t have any desire to head back out over ground I’d just rolled across. Loke would have been even slower on it just from sheer boredom. Monday, November 16, out again. That one was a proper ride. A bit over 10 miles as I rode toward downtown Uppsala and stopped at the American Food store. Charles’ wife was there it turned out. She was in the back putting extra stock away. I stuck my head back there to greet her while the woman helping them out rang up the few goodies I picked. It was a brief catch up, but nice to reconnect. From there we rolled out toward Vaksala just because I wanted the extra 5 miles or so. A good ride actually. I was pleased to see that my higher cadence continued. That it might be the new normal made me grin. Glutton for punishment that I am, I pushed myself out again on Tuesday. I would have been better off taking a rest. It was harsh. My legs hurt and had no strength which of course impacted my cadence for the worse. The ride was barely 3 miles. I simply had nothing in me to do more. Honestly, it wasn’t even worth the effort of getting changed and hunting for a parking spot near the storage. That has become an even scarcer commodity with road construction blocking over a dozen spots along the street that used to be parking. So, with Wednesday being a rest day, I was going to be starting the official last 6 weeks of the year with 205 miles left. It comes out to about 34 miles a week. I figured that barring snow as deep as my hips or lots of rain, a health set back for me or Loke, it’s doable. After all, between November 8th to 14th, I did over 40 miles. I ‘ve already been out today (Thursday, November 19) with Jens dropping us off at the storage before zipping off to work. Not an auspicious beginning. It felt almost as bad as it had on the last ride. Legs aching, very little strength and my cadence way down over the 2.73 miles as I rolled from storage to home. It almost makes me wonder if it’s not the need for my muscles to rebuild from exercise that made today and the last ride so hard, but some sneaky post-stroke issues masquerading as exercise fatigue. Fatigue or stroke stuff, I’m still going to go out again for at least a few more miles. Loke can use it and so can I. What was that about 1225 miles for 2015 being a soft target? Amazingly, after how harsh the 5.16 mile ride on Thursday, November 5th felt, I pushed myself out again on Friday, November 6th. The new Black Ops game was out and Jens was in a frenzy to play, begging me to take Loke out with the trike so he could veg in front of the TV with it. It turned out to be a very short ride. One of the shortest of the year. The only ones that have been as short or shorter are those where I’m rolling the trike back to the storage in the twilight after Jens had gotten home from work to bring me back home. My legs had no power. Every turn of the pedals took a lot of effort and determination, it seemed. I think the only reason it was as far as 2.31 miles was because some of it was downhill and Loke pulled some. I still had a hard time walking the short distance between the storage and the car. Hubby’s focus on Black Ops or not, I determinedly made Saturday a rest day. Yes, I wanted to break 1000 miles, the sooner the better. I also wanted my rides to feel at least somewhat enjoyable. Gritting my teeth and forcing exhausted muscles that need time for rebuilding to crank pedals at half my usual cadence is not what I call fun. Particularly for something as mind-numbingly tedious as local rides. I bulked up on protein and took Loke for very short, but fairly frequent walks. Jens finally relented and interrupted his game obsession to hurry Loke through a longer walk. After 3 days of pushing myself on consecutive rides after 3 weeks of barely riding at all, I felt pretty good after just that one day of rest. With that recharge, I let Jens happily play on before heading out for a ride around 10:45 am on Sunday, November 8th. It’s trying to come out! The sun that is. It had been raining all that morning, which had left me filled with doubts about getting out, but then the rain slacked off. To give me an extra boost to endure a local loop, I decided to swing by the American Food store. It’s been a while. The thermometer insisted it was about 44-45 F, but when I stepped out the chill was like a slap in the face. It prompted a mad dash back inside to pull on another layer of protection. Perhaps it was the wind, but to me, it felt more like it was near freezing. Instead of heading directly south toward town, I took the first leg of the River Loop, turning north, climbing the overpass and then flying down big hill toward the bridge. From there, I followed along the water’s edge before zig-zagging into the heart of the city. It was a gray morning and blustery. At least the breaking clouds and attempts of the sun to emerge put fears of rain to rest. Wool or not, getting wet with that wind would have been downright unpleasant. Loke was happy to be out again. His legs, getting darker and darker with mud were a blur as he trotted briskly along, seeming to enjoy the chill breeze ruffling his fur. Alas, I didn’t get to step into the American Food store. They’ve moved from their street side location into one of the many, small downtown malls. I was convinced that they opened at 11 am. Nope! The mall was locked tight until noon on Sundays. When I came back to the trike, Loke gave me such a hopeful look, big brown eyes wide and expectant as his bushy tail wagged. I didn’t have the heart to torture him by waiting there for 20 minutes. Nor did I have the interest in circling the area for that long. Onward! I couldn’t decide exactly how I wanted to loop back toward the storage. I figured I had two choices and the turn between them was further on, in the area where my husband’s parents used to live. I think I’ll try to avoid that stretch for a little while. I’d completely forgotten that the cycle path is lined with chestnut trees of all things. The nuts, in their spiny casings have mostly fallen, but now are being pummeled by bike tires and probably the feet of the people who have the misfortune to risk twisting an ankle by stepping on them. It made for a jarring ride with the trike, but at least I can’t clip and tumble. The bigger problem was Loke. The few nuts that were whole and out of their casings weren’t so bad, but the pointy bits of split rinds and cracked shells made him wince when he came down on them just so. We took it slow and I wove carefully back and forth to try keeping him in the better stretches. When it came time to choose which loop to pick, it was the call of nature that decided. I needed a restroom. The turn to finish up with about 12 miles that would take me along part of the Linne trail by the river and back through downtown Uppsala really had no option for that. The other way was to head toward the Granby mall which meant passing Vaksala church. Built into part of the churchwall there is a brick and stone building that dates to the 1600’s (or is it 1700’s?) and within are restrooms. Nature chose for me. From there it was a quick jaunt toward the mall and swinging through the 4H grounds. The clouds had been breaking up and thinning since leaving downtown. By the time the mall was at my back and we plunged down the hill to the parkland behind the pastures, the sky was mostly blue with puffy clumps of white and glorious sun. The meerkat is back! Crappy iPhone photo or not! Along one of the paths hugging a pasture fence line, I was glad to see an old friend. This park has a number of sculptures. I couldn’t even tell you what the others are, but this one has always made me smile. Not sure why there’s a bronze meerkat here in Sweden of all things, but there he stands, keeping watch. Or usually. I think I neglected to mention that on the previous ride through here, I was disheartened and a bit angry to discover vandals had covered the pedestal in graffiti and the meerkat was gone. Bronze is not light. It must have taken real determination to wrench it loose and carry it off. Yet, here it was, back in place and overlooking path and pasture like before, pedestal mostly cleaned up. I wondered if they’d recovered him or if there was a little storage room somewhere, full of 2′ tall bronze meerkats waiting their turn. I find that oddly creepy. Such statues bear the brunt of destructive people. Even the Little Mermaid in Copenhagen harbor has had her hardships. I seem to recall she’s had her head removed at least twice. The Golden Path. Yes, a geeky Dune reference. Beyond there is the homestretch. It left me with one more visual treat though. Turning left where the park ends at the verge of a complex of apartment blocks, it passes through a tangled growth of conifers. Many of them have shed their needles in preparation for winter. They’d all gone golden and beautifully covered the path. Loke gave me such a rude look when I braked hard to pull out the iPhone. Too pretty to resist. Finished up back at the storage with 10.82 miles which I found most satisfactory as it left just a bit more than 26 miles remaining for my goal. It also had the distinction of being Loke’s longest run since his surgery in October. He still had plenty of energy left, but I still felt some effect from the hard riding earlier in the week and getting accustomed to the clunky, studded front tires. Those tires were starting to cause me a bit of stress. They’re not cheap and while one is supposed to ride a bit on them to set the studs before hitting snow and ice, they’re not meant to hammer pavement exclusively. The studs are tough but they will wear down. Not to mention, they take quite a bit more effort to push than my other tire choice. There’s still be no news on my ‘summer’ tires though. I was trying to cheer myself up about it by telling my conscience to think about how much stronger I’m getting. How much easier it will be when I do make the change back to standard tires. Monday, I made into a rest day. It was easy enough. Jens headed off to Copenhagen on business. Instead of flying, his dad came along and they took his car. My FIL absolutely adores Copenhagen so was delighted at his son’s offer to share the hotel for the chance to wander the city and surrounding areas while my hubby tended to clients. Loke was surprisingly quiet for the entire day. He played rug and for the first half of it. I had to bully him out the door for the short walks. He didn’t so much as say ‘hi’ to me of his own accord until about 9 pm. Then he came over and got in my face, nudging me with an expectantly wagging tail, before bounding over to the door. I wasn’t fooled. He didn’t need to go out so much as him knowing how it is. 9 pm, he gets the last walkies and then comes dinner. Sure enough, once out the door, he couldn’t hustle me around the short block fast enough to charge back inside and sit by his food bowl. I take pictures of this view way too often. Tuesday, October 10th, I felt strong enough to go out again. It was a gorgeous day. Utterly clear skies and I remember the air being wonderfully still. Loke was thrilled to have such an early go of the day. I headed out along the usual beginning of the River Loop, intending to do what I’ve dubbed as the Vittulsberg Loop. It can be either 10 or 14 miles. Usually I do the 10 miler because there’s about a 2 mile stretch between flat, featureless fields of pure tedium I simply have no patience for. That plan ended up being cut short, by a decision to take the Grave Mound paths. While the longer distance called in such lovely weather and my goal so close, I felt annoying short on stamina after my day’s rest. The combination of the gorgeous November light, particularly early on such a stunning day and a few things I was curious about set me out with a smile on my face. The happy furball beside me, breath puffing in a soft pant through his husky grin, added to my tolerance for such old ground. I can even say I enjoyed it. At least it was a pretty day. At this time of year, I find gray, raining weather annoying because it really should be a winter wonderland in this part of Sweden. The River should be frozen with the tracks of hares and foxes crisscrossing the snow. The fields, plowed for winter, should be blanketed in white, not showing a dreary, muddy brown surface that looks even worse when the sun is closed away behind a leaden sky. There were even earthworms on the cycle way. Earthworms! In November in Sweden! Seriously? I want winter, dammitall! Not critters wriggling on pavement when they should be dug down deep and dormant under snow. We rolled along the river, followed Gamla Uppsala road to the mosque to continue on to the Gamla Uppsala proper. Just across the rail tracks and up the gentle hill past the museum, I found out why they had cordoned off the little mound in front of the restaurant last month. It’s getting a fence! Yay! Fencing! Ever since I’ve been in Uppsala, this poor little mound has taken the abuse of countless feet eroding its surface. Breaks my heart to see the scars on the surface. A couple years ago, they tore out sections of fencing from around the bigger mounds which led to a stampede of people that way. It’s given this mound a chance to recover as it sits ignored thanks to the lure of the much higher views. Love the light here at this time of year! Of course, that’s meant the royal mounds are showing the damage of such attention. Earthen scars on their faces, torn open by herds of people and mountain bikes in snow-less seasons and by sleds when blanketed in white. During rain and thaw, those wounds weep mud, cutting them even deeper. They’ve endured a thousand years or more, but people who want a high view of the surrounding landscape are just battering them down. Yes, I’ve climbed them. Only once and it will be years more (if ever) that I do it again. I also went with care and avoided the erosion, stepping on hearty growth that shrugs off the passing of a single person and a dog. I guess they pulled down the fence around the larger mounds to give people something to climb while the small mound is allowed to ‘rejuvenate’. It’s a project put in place by for just that reason. If that’s the case, they should have waited until they closed off this mound to make the abuse the larger ones took more brief. The sign seems to imply that this mound will be protected until the vegetation reclaims the eroded paths and it will be reopened in several years. Pity if that’s the case. Even after all these years, Loke still loves it when we come through this area, as do I. We hit the gravel path and his pushes his speed until his legs become a blur at a trot and sometimes pulls into a lope. He still makes an effort to run down the big hill though the days of 18-20 mph charges are well behind him. I need to remember to take him easier down such slopes though. I’d hate to hurry along his arthritis that way. Much better to keep him jogging longer than running harder but more briefly. As we came through the wooded section and navigated the short climbs, one quite steep, we soon arrived at the next point of curiosity. For the past year or so, there’s been work done on a stretch of fields along the gravel path between a portion of what I call the River Loop and out toward the mounds. It started off as huge pits. Not very deep, only 3 or 4 yards, but huge, 100 or 200 yards or more in all directions. At first I was worried it was some large scale construction, that a honking huge, cookie-cutter residential area was going to be plonked down with the MUP path turned into a road. Turns out it is a project to restore the natural clay subsurface to the area. There was a brickworks somewhere around there and it stripped the clay layer from the environment for it’s production line. Sure enough, they started filling in those pits with endless truckloads of clay. Restoration I can respect, but I do wonder where they’re getting the clay from. It surprised me how far it’s come since I rode through here last. They were still working to flatten the mounds of imported clay and the double path had been merged into a single early in the project. Now, they’re bringing the topsoil back in. They’d not started laying it out yet, but at least it’s there and waiting. I was also surprised to find they’d re-established the 2nd path again. Honestly, I expected that they’d leave it as a single through that stretch. It made me oddly happy they were returning the area back to the place of many fond memories. Or even less fond, like getting stung 3 times by a yellow jacket that Loke angered… on my birthday. Finished the ride with 7.28 miles which left less than 19 miles for my goal! I found the reason for my low stamina and it had less to do, I think, with hefty tires and tired muscles. My cadence was up. Most times since the stroke, my ‘cruising’ spin has been roughly 62-68 RPM. It peaks higher clearly and I often had a few minutes here or there where I’d hold 75-78 RPM for a time. The October 11th ride, it had taken an inexplicable leap of nearly 10 RPM. I was ‘cruising’ at 76-80 with brief moments in the 82 RPM range. I shocked! Thrilled, but still shocked! I didn’t have the stamina for a longer ride at that pedal pace, which was a bit of a pity, but to see such a sign of increased fitness is great! Then it was out again on Wednesday, November 11th. Another beautiful day. Went out again about as early as the day before, 8:30 am or so, which isn’t very long after sunrise at this time of year. The temp was a bit higher than expected as I rolled out, about 40 F. So, imagine the surprise upon discovering frost over the grass and patches of fallen leaves in some places. Mostly it was in areas where the sun doesn’t really get to in November. The narrow cycle paths lined with tall, unclipped hedges and trees is a good example. Some of those sections even had frost on the pavement or a fine skin of ice where the wet from the last rain held on thanks to high humidity over the passing days. As we came down the big hill leading down to the river, I was glad of my studded tires. They finally came in handy! I hadn’t realized the icy condition of the cycle path at that moment, even when stopped to take a photo of frosted, fallen leaves I thought was pretty. I stopped just fine, annoying Loke. When I went to stand up, one foot shot out from under me and I plopped back in the seat. I hadn’t noticed even during the stop because of the studs. Studs were good. Coming down that big, frosted hill would have been more excitement than Loke could handle otherwise. Or me for that matter. Skidding out of control faster than he can run. Not a good image. Hey! Something more like we should have in late autumn at least and no earthworms! Other than that, it was just another River Loop. Sunny skies, nice light, down hill, across river, blah, blah, blah. It spared me from the 2 early-in-the-day walks with Loke and gave me 6.62 miles toward the 1000 mile goal. That left just 11.67 miles! 2 rides or so at the rate I’d been going. My legs were somewhat tired from the 7+ miles at higher cadence the day before. This means my RPMs were more like my old speeds. Loke was also a bit sluggish on the outing which could easily have been boredom so intense his brain was shutting down for sleep. I so know the feeling. Just with my mileage being so low and the days feeling so very short, makes it hard to plan longer rides. We still have over 7 hours of daylight current and at least now, the rate of loss in daylight is now less than 5 minutes a day, but I still feel that there’s not enough time for something like another leg of the Mälardalsleden. I guess I need to shake that off before the snow comes. Maybe if we’re still snow free and my narrow tires arrive for next weekend? Snow would at least do that much. Take this scenery I’m so bored of and make it magical and new. It is pretty scenery, I feel bad that I’m weary of it, but there it is. Thursday, November 12, I took another rest. No need to push things until every turn of the pedals is a titanic struggle before giving myself a recovery day. Besides, it was probably good for Loke too just in case he’d been draggy because he was tired rather than bored. That might have been the case because about 4:30 pm, he turned into a pest and remained so even after a couple walks. I had no wish to wrestle the trike out in the dark and get a headache from glaring headlights in my face. Not to mention rain. It was gray and miserable, above freezing, all day. Got wet on all the walks I took with the furball. The forecast indicated that Friday morning was going to be rain free with Saturday and Sunday pretty nice. I considered waiting for the weekend to ride again. Loke being perky changed my mind though. Jens was coming back from Copenhagen and he’d appreciate a husky with somewhat reduced energy levels. That 11+ miles kept nagging at me too. My legs felt pretty good, rain wasn’t supposed to arrive until sometime after noon so I’d miss it if I got an early enough start. I decided I was going to do something other than the River Loop. Maybe the loop out toward Läby and come back through Uppsala. That didn’t have much appeal honestly. It had been ages since I’d done Ulva/Gamla Uppsala and it’s right about 12 miles. Enough to put me over 1000 for 2015 and hopefully not too harsh with studded tires. Loke was thrilled as we set off. So was I. Yes, it was gray and looked like the bottom could fall out of the clouds any moment, but I was headed for the countryside which I’d not passed in a couple months. Not new, but at least I’d not seen it 6-8 times in the past 2 weeks. I also felt surprisingly warm. Roughly 37 F just as we left the storage behind and once out among the fields and woods, my Garmin showed 33 F. Yet, I didn’t need my jacket and even my gloves stayed packed away. Maybe the faring was helping with that? Hard to know. In the shoe-covers my feet felt almost too warm which certainly helped keep the rest of my body temp up. Once we crested the steep little climb on Gamla Börje Road, I breathed a sigh of relief. Loke tried to run, clearly glad for different sights and scents. As we rolled along that little countryroad, I spotted the poles that line the rural roads in the winter. Such a cruel tease. A reminder of what should be, but stubbornly refuses to come. Snow! Just a couple inches would be lovely. Enough to brighten the landscape even if it melts from the roads and paths quickly. Granted, we need a few days of good hard freezes for it to stick any where. Loke was happy at least. Even without snow, the taller weeds are disappearing from the edge of the roads. How very kind of someone to set up an endless array of tall, if narrow objects for him to leave his ‘marks’ on during countryside runs. He tries to do just that on every one that I come too close too. If I’m almost close enough, but not quite, he gives me such a dirty look. About the trike I reached the countryside, the sun made a fitful attempt to break through the clouds. It was no more than a pale disk visible against the gray. A few minutes later, it did a little better. It was a brief flirtation though and it quickly vanished leaving a leaden, shadowless haze. When he wasn’t trying to swerve over to mark poles, Loke set a surprisingly brisk pace. He wanted to clip along at about 8 mph, sometimes faster. I had no problem matching him with a cadence as high has it had been on November 10th. At first, I tried to temper myself to a lower pace with 10 more miles to go. The moment my mind wandered with my eyes across the scenery, it crept back up. I gave up and let my legs go as they wanted. When we came to a semi-flat stretch, I surprised myself. Loke stretched his legs to jog along at 9.2 mph. A quick glance at the Garmin displayed 83 RPM. For 20 minutes, we zipped along and every time I looked over at my cadence it was consistently over 80. For me, that is very impressive to sustain over that duration. At least since the stroke. I never paid much attention to cadence before. Once we got to an area less flat, I made a concerted effort to stay under 80 RPM at the very least. I wasn’t sure how long my knees could sustain such a pace and didn’t want to find out the hard way. The clouds had to struggle to keep their grip across the sky. The sun made a few more struggles to emerge, once even enough that our shadows ran faintly beside us for about half a mile. I even saw pale smudges of blue between the gray at times. In the end though, the overcast won though at least the clouds were more dramatic instead of a featureless lead sheet. That kept me focused as we came up to Ulva Mill. I made the turn I usually do to go by the cluster of old buildings with the joiner and silversmith and come out near the mill itself. That whole area was closed off with temporary fencing around big holes. I guess they’re working on the water and such. I had to loop back out and take road around the turn. It wasn’t just the courtyard area between the buildings they were digging up. There was an area on the far side of the mill race that was slightly dug up too. It looked like they were making repairs to some of the stone lining the race itself. I still felt pretty strong as I climbed up from the river, one of the steepest climbs on that particular loop. I could feel the weariness though. I was going to be glad to get back home. Then it was the long but gradual climb along the old E4. About a mile of fast moving traffic through there. At least there’s a wide shoulder so the cars never come closer than 8 feet or so. Loke and I both breathed a sigh of relief as I made the turn onto the quieter road that leads to Gamla Uppsala. The first part of it goes fast and then it’s another short, but semi-steep climb. We had an audience as I cranked up with climb. Not far from the fenceline, a pair of cows watched with that blank curiosity only cows can pull off. The cream colored one never looked away near as I could tell. The brown one glanced in other directions from time to time. Seemed odd there were only those two in the pasture. Maybe they evaded notice when the rest were brought in. In moments, I was pedaling up past the Gamla Uppsala church. I still smile every time I see it. Imagining it during its glory days when it was the cathedral of the archbishop of Uppsala, before the town was moved to present day Uppsala. Coming along the grave mound path was work. All the rain we’ve had has turned the gravel to mush. It’s not as bad as miring mud or sand, but it is extra work added to the studded tires. The murky sky and surrounding fields all in shades of brown made even the royal mounds seem rather dreary. Loke, all black around the belly and legs from mud, didn’t mind the wet. He doesn’t like puddles or rain, but hardly notices when he gets all mucky from wet ground. When my Garmin showed 10.7 miles, I watched it much more closely. 1 mile. 0.9 mile, 0.8 mile…. Yay! 11.7 miles which means 1000 for the year! And then there it was! 11.7 miles which officially put me over 1000 miles. 1000.03 actually. It never fails to baffle Loke when I cheer at something. He gives me a strange look and then looks around for whatever I’m making noise about. I also texted Jens, who was, at that moment, driving across Sweden from Denmark, news of the accomplishment. It was just a short jaunt to the storage from 11.7 miles. The ride finished with 12.38 miles. Once I plugged it into BikeJournal.com, it said I had 1000.24 miles for 2015. There’s still more than 6 weeks left. BikeJournal has 1,220 miles listed for 2008, my most miles in a year ever. The math insists I need to do a minimum of 37 miles a week to break it with 1,225 miles. I would love to do it, but weather and my resistance to longer local rides makes it feel rather iffy so I’ve not really set it as a goal. It would be awesome though… wouldn’t it? Felt like ages. 3 weeks to get back to semi-normal. Loke was due to get stitches out on October 30th. On October 29th, Jens worked from home though, so I took advantage of that to get some distance in. I can’t remember exactly why, but I decided to do the loop through Uppsala and come out near the cycle shop. There was still no word from the large cycle shop about the tires and my brakes needed work any way. So, swing by there to schedule work time and, if they could, let the awesome shop order said tires. It was a gray day, cool, but not cold. Thankfully no rain in spite of the heavy cloud. Autumn had held on for a long while, refreshingly colorful for a change. Leaves were starting to drop though. On some trees, it looked as if they’d held a count-down and all plummeted from their branches at once. Don’t remember much about the roll through town. I took the route along the rails, by the park with the bronze statues of the pony and ram to go to Vaksala church. I do remember my hips hurt. Annoying now that I recall that. The ride would have been longer and through the countryside. Being solo, it was a bit faster than usual of course. I also now remember that about half way into the ride, I started hearing/feeling a ‘whump-whump-whump’. At first, I passed it off as the surface I was rolling over. It persisted even after a turn onto gravel and back to pavement. I checked my wheels, but didn’t see anything. It was coming up on dusk when I rolled to a stop outside the cycle shop. It was a bit busy so I had to wait a few minutes while Neil finished with a customer. Glad it didn’t pop! That’s the Kevlar layer beneath the rubber. I quickly explained that I wanted to order tires as well as schedule some work on the brakes. To be sure he ordered exactly what was needed, we went out for him to take a look. As he turned the left wheel, the source of the ‘whumping’ was revealed. A section of the tire looked like the rubber had been shredded. I’d already decided months ago that this was going to be the last year for the tires. These are the ones that arrived with the trike back in November 2012, but I would have preferred if they’d not been so close to catastrophic failure before I had my hands on new ones. When Neil saw that, he asked if I’d like to wait to get the work done when the tires arrived. Unless I had spares and needed the work done to keep riding. I admitted I had no spares and the trike wouldn’t be going much of anywhere until I had them. Personally, I liked the idea of someone else doing the tires for me if it wasn’t going to be costing me miles. Anything that keeps my fingers from turning to raw meat and spares my back. Sadly, the tires weren’t going to be available before the weekend. So, even with Loke getting his stitches out the very next day, no running for him. Except at the end of his leash any way. Friday went fine. Showed up a bit early at the animal hospital and was in and out in less than 10 minutes. No muss or fuss. The wound was fully healed, the stitches came right out with no need for sedation. Loke looked irritated at being on the table and having his tail held up more than anything. The weekend went by with Loke and I both about the climb the walls. The previous week, he’d been getting more and more in our faces and harassing us. Poor fuzzy was desperate for an outlet. As for me, I was suffering too. Before October 19th (Bloody Monday), we’d been getting out with the trike several times a week. We were fitter. Even my heart rate is down. About two weeks ago, I’d stopped in the middle of getting ready for bed to check my blood pressure. It was fine, but more surprising was my heartrate. 52 BPM. Not even my ‘official’ resting heartrate as I’d been moving around rather than laying quietly for 5 minutes or so before taking it. Color me impressed. It’s not quite that good after 3 weeks with so little riding, but still decent. My suffering though was a resurgence of my post-stroke neuromuscular pain. The last few days of October and first few of November were hellish. The episodes were coming almost daily, longer duration and worse. By November 2nd, I started having entire days of agony. The only thing that had changed was riding. The months before Loke’s tumor burst, I felt great. Best I’d felt since before the stroke, maybe even better! The riding had all but disappeared and I felt worse and worse as the days went on. Nothing like excruciating pain to make one miss riding even more! Monday, Jens noticed on Facebook that the cycle shop announced it would be closing it’s workshop area for a while while they moved it from one section of the store to another. He immediately suggested that I maybe see if they could fit my trike in for the work I wanted done as it could be a week or more before they’d be doing mechanical stuff again. I agreed I’d get it done on Tuesday while I ran other errands with the car. Tuesday got a little complicated. I’d left a message with my hubby’s sister, Tina, to see if her hubby could come help me with adjusting the mount on the fairing. During the last portion of the Mälardalsleden, it shifted so outer edge of my right foot was exposed to the wind. I thought we could put our heads together since he’s a handy sort. He called Monday night to arrange for us to do that Tuesday about noon. So, we got that done first. It turned out to be much easier than anticipated. When my husband’s father and I first mounted it in an awkward spot, I though I needed more room than was actually required. That meant when ‘M’ and I looked at it, we discovered we could put the mount further back. No complications. Still enough bar available to hold the fairing solid and right on the boom tube behind the screws clamping the pedals in place. Perfect! Took all of 10 minutes. Then it was a quick race to do errands and stopping at the shop. It turned out that they could do the work the very next day (Wednesday, Oct 4th). Their last day before closing the work station for moving actually. When I got back home, I started to whip up a batch of my lemon muffins for my brother-in-law as a thank you. The worst muscle pain I’ve had in months slammed into me like a freight train. From the top of my head, to my heels and fingertips, every muscle burned like acid. I could barely hold the spoon to scoop the batter into the muffin tin without weeping. I’d not hurt that much since the first month or two after the stroke. ‘M’ was so thrilled to get them that it was worth it though. Jens dragged his feet about getting ready for work on the morning of Oct 4th. I finally had to bully him out the door so Loke and I would be able to get the trike to the shop by time they opened at 9 am. Loke was crazed with glee as I started getting the trike ready. It made wrapping the bad section in duck tape a bit tricky with the fuzzball pawing at my arms and tangling me and the trike in his cable tether. I finally decided it had to do and we rolled out… slowly. I also removed the wind screen to make moving the trike in and out of the shop much easier. It was about 55 F, so my feet weren’t going to suffer for it. It made Loke insane. His first trike outing in 3 weeks and we were creeping along at 4 mph or less. It didn’t help either when I steered us along the most direct route to the shop, stopping to check the tape every few hundred yards. It was just 1.22 from the storage to the shop. Of course, we were about 20 minutes early. Loke, of course, wanted none of sitting still. He woofed at me. He pawed at my arms and legs. He even tried to ‘cute’ me into moving by smooshing his nose into my cheek and temple which is his way of kissing. The shop opened a bit late of course. About 5 min after 9 am, Lotten (think I’m spelling it right) came flying up and running to the door. About 10 minutes to 9, Neil (the owner) had called her to ask who was opening the shop… on her scheduled day off. Poor woman. Her day off and she’d had to fly out of bed to come open. Once the door was unlocked, she had to hit the ground running as there were 3 others waiting after me. Once I had the trike checked in, I called Jens’ dad to give me a ride home. It had been arranged the evening before. With the crazy amounts of muscle pain I’d been having, walking home wasn’t in the cards. The flood of people slowed so I went back in to look around as I waited. Lotten and I ended up chatting. It started by her asking where I was from in the US. She laughed when I answered, ‘Mostly from the southern U.S.’. She told me she could hear that much, but what area? When I said Gulf Coast. ‘Anywhere near Biloxi, Mississippi? I’ve been there,’ she asked. I had to laugh. Small world as I’d lived in Biloxi for a time. She also knew about Mobile, Alabama. Then it was time to go. Loke was ecstatic to see ‘grandpa’. My awesome FIL also offered to drive me back to the shop if they finished with the trike before Jens got home. About 2 pm, Bobby (the mechanic called) to say that my winter tires had arrived though the others were MIA. Did I want him to mount those and hope that the snows came soon? ‘Aren’t you supposed to ride on pavement for a while anyway to make the studs solid in the rubber?’ I asked. ‘Yes, actually you are. I’ll put them on then!’ he said. I got the text that everyone was done at about 3 pm. I called Åke. I was there about 3:30, as the sun was already sliding toward the horizon. I was still determined to add a few miles on the way back to the storage though. I was good to go! I had my lights! I was giddy as I assembled the trike outside the shop. The brake cables had been crossed so left would stop the right and vice-versa. That would make dealing with Loke on the ice so much easier. I could hang onto his harness and stop the right wheel at the same time if he tried to pull the trike broadside. Crappy photo, but there’s one of them! I’d also had cable oilers installed! I was so thrilled when I’d mentioned them a few weeks ago and Lotten knew what I was talking about. These look different than the ones I knew about, but if they let me blast the ice out of frozen cables I’m happy. If it gets cold enough, I’d rather not struggle through snow, ice and hills with only 3 gears from the front chainrings. I’ll admit, I’m wondering if we’re going to have another ‘Mississippi winter’ like the one in 2013-2014. At least there’s already been more frost this year than that one. It’s still been unseasonably warm though. The sun was disappearing quick as I said farewell to my FIL and we rolled out. I let Loke have a bit more speed. I just needed to stay on pavement and avoid sudden stops. Naturally, in the first mile, I had to slam the brakes when someone came whipping wide around a blind corner on his bike. Gave me a dirty look like I was the one at fault for our near collision. I was firmly on the far right of the path. Abruptly, I noticed a problem. I only had my rear light. My front light was on the fairing. That mean I had to cut the ride short. I couldn’t do it. Poor Loke. I decided I’d go by the storage and remount the fairing. It was getting cold with the sun going, so I wanted that extra protection. The furry was baffled when I didn’t roll us down the ramp. It took a few minutes. The light was almost gone, but I turned the trike around and we rolled on. Loke was crazed. He tried to pull us faster and faster. His tongue flopped in that goofy husky grin I love so much. The temperature was plummeting. It went from 44 F when I rolled away from the shop to about 36 F as we came down the big hill to cross the river. 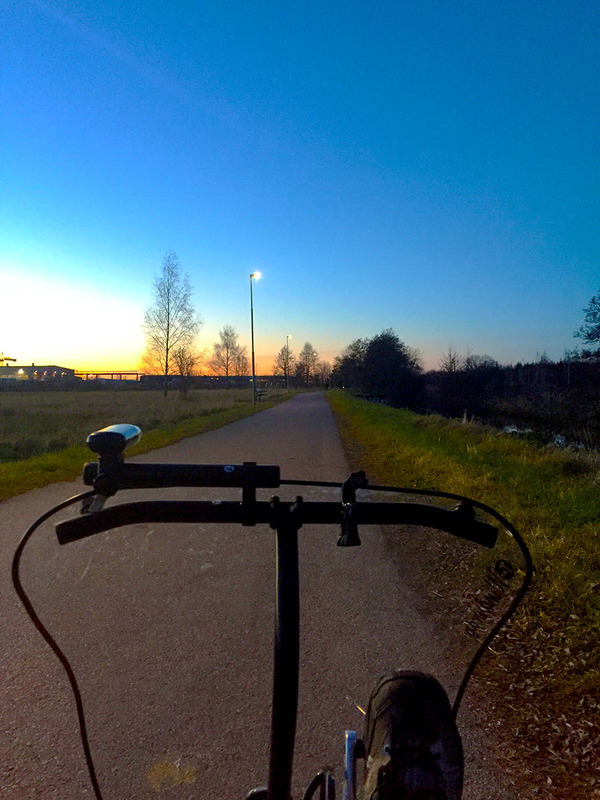 As the last of dusk was fading, it actually hit 32 F. My first freezing ride of winter 2015-2016. I started to regret the longer ride. I was dressed for above freezing rolling. I didn’t have bit of wool on anywhere. My legs above the knees were unhappy. I finally had to stop to wrestle on the shoe covers that were hiding in my bag. As I left the riverside and joined the cycle paths running beside the busier roads, I decided I’m not a fan of riding in the dark. At least not in town. The glare from street lights were bad enough, but the headlights! At least with the sun there’s sunglasses and I can tilt the brim on my helm. Headlights come from varying heights, angles and directions. A few times it was so bad, I couldn’t make out the edge of the path and nearly steered Loke into a post. Fortunately, I paid attention to him and was going slow. By the time I made it back to paths away from the roads, I had a splitting headache. I think if I must ride in the dark, I would prefer country roads in a snow-blanketed landscape accompanied by only bright lights on my fairing and the glow of a full moon in a star-studded sky. Jens still wasn’t home when I was finishing up with the ride with a bit less than 7 miles, though he was on his way. My legs were so cold. I decided to go home and wait the 40 minutes for his commute where I could thaw. The call came that he was about 15 minutes from home, so back out into the dark we went. Loke was thrilled to death. He bolted off, determined to drag us along at warp speed. Back at the storage, we’d rolled a total of 8.5-ish miles. Not bad for starting out with a duck tape wrapped tire. As for the ride itself, aside from freezing and the headache from glaring lights, it had been great! Even with chunky, studded tires, I’d felt strong as if I could have added another 20 miles with no problem. Provided I took the time to add some thermals. It occurred to me during the ride with legs turning to blocks of ice, how my fears have shifted. The first year I was in Sweden, I was treated to a blood clot in my left leg. For years after that, I was paranoid about my hands and feet getting very cold upon learning that it could cause blood clots. I don’t seem to have that fear any longer. It still passes my mind from time to time, but no fear. Good I guess. Friday, November 5th, I woke up stiff and tottering around with the muscles in my thighs aching. The kind of pain I can handle because I ‘earned’ it by exercise. It came as a surprise though given how easy the ride had felt. Perhaps it was just a combination of so little riding in 3 week and the higher rolling resistance of the tires. Even so, about 10 am, out I went again. We had reserved a table at Jay Fu’s with Jens’ parents. That meant, Loke needed some exercise before we went. During the previous night’s ride, I had a little trouble with the parking brake. The lever kept hitting something. So, before we rolled out on Friday, I looked at it. It appeared that it had shifted. I fetched my tools and moved it back where it’s been since it was mounted by the guys at ICE. It was a rough 5 miles. My legs were not happy legs. Loke was thrilled though. He happily jogged along even though it was over cycle paths we’d already rolled over the night before. I also discovered that the parking brake lever hadn’t slipped, but Bobby had moved it and for a every specific reason. I did a particularly sharp right turn and the trike lurched to a stop, the brakes locked and I couldn’t straighten the wheels. It took me a moment to discover that the parking brake lever was hung up on the other brake cables which had been moved around a bit to accommodate the cross-wiring. Silly me had left the tools back at the storage so had to suffer along until I got back. That happened a few more times. I was exhausted, but still took the time to re-position everything where it wouldn’t tangle (hopefully), but I could still easily get to the lever. It’s not been tested. Today is a rest day before my legs fall off. Loke could run more, certainly, but he’d have to do all the work and I’m not sure a 10 year old husky should be dragging me around. P.S. Two rides and the neuromuscular pain is happening much less and with less intensity. Gotta love recumbent trikes.